Yes! Yes, technically I am a Necromancer. But I’m not one of those foolish people who take up residence in cemeteries so that they can raise an army of dead. Have you SEEN an army of the dead? They’re more expensive than a living one, and far less use…I want to defy death. I want to…well, for want of a better word, cure it. Oh this book was brilliant and is probably one of the BEST books I’ve read so far this year. It was wonderfully witty and came off as a Gaiman/Pratchett/Little Nicky piece which in thought, is absolutely brilliant. 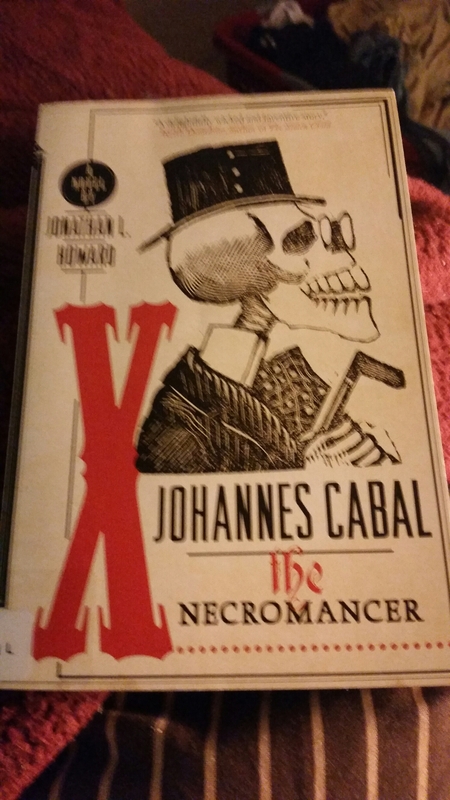 Johannes Cabal is a Necromancer. He traded his soul to Satan to gain powers in necromancy, but alas, having no soul is effecting his research. So he decides to make another deal with him. 100 souls in a year and he can have his soul back. The catch? He has to do it using a Carnival and a budget. He frees his vampire brother, Horst, from a crypt he had left him 8 years prior and they take to the rails as ‘The World Renowned Cabal Brothers Carnival.’ Along the way, they meet an assortment of odd characters and Horst has to keep his brother in check, lest he loses his humanity. I don’t hate death. It’s not a person. There’s no grim skeletal figure with a scythe. I try to avoid hating abstracts. It’s a waste of effort. Never discuss murder plans with the victim, he reminded himself. It takes all the spontaneity out of it. I loved, loved, loved loved this book. It was quite wordy but deliciously so. And hilarious. It had the tone of a Pratchett novel (wit, sarcasm, etc) while posing morality in the face of evil. Johannes isn’t a very good Necromancer but his heart is in the right place. And his brother is absolutely delightful.